Yes, vaulting is considered the safest equestrian sport, as the most common injury is ankle sprains. According to the American Association of Neurological Surgeons, horseback riding produces less head injuries per year than Football, Basketball, Soccer, riding bicycles, and playing Softball. Vaulting is fundamentally different than most other equestrian sports and focuses on the "Three Points of Vaulting of Safety" which addresses the three main risks of riding equines. 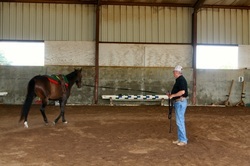 Control of the horse is ground-based on a 20-meter circle in an enclosed arena, with special footing for the comfort and safety of both humans and equines. Vaulting is performed in a highly controlled environment—a fully enclosed arena with the horse on the end of a longe line in a 20-meter circle with soft footing. This decreases the likelihood of environmental factors that cause riders to lose control of and possibly fall from their horses. Vaulting's focus is on working harmoniously with the horse. The requirements for the vaulting horse decrease the risk of the horse shying, spooking, running away, etc., all of which can cause rider falls and injury. The United States Pony Club Vaulting Handbook states, "Using vaulting techniques, the time required in learning to ride safely can be cut in half. It reduces chances of injury from a fall. Rider training is enhanced with the improvement of confidence, suppleness, balance and rhythm. By increasing confidence and balance, vaulting decreases falls; by teaching proper vault-offs from every position as well as good landings, it reduces chances of injury from a fall." Attention to safety and safety practices are part of every vaulting practice. Vaulters practice their vault-off and compulsory and freestyle moves on the vaulting barrel prior to working on horseback. The vault-off, in which the vaulter learns to dismount quickly and with control in the event of a loss of balance or emergency, greatly enhances the vaulter's safety. For more information, please visit the AVA website. 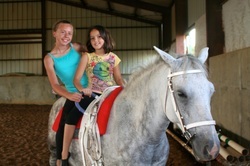 "Three Points of Vaulting Safety" written by AVA and available on their website.